CRU removable drives are the industry standard for data security and data transport. Trusted by government agencies, the military, and major manufactuers, our reliable removables offer the simplest and best way to move large data sets. 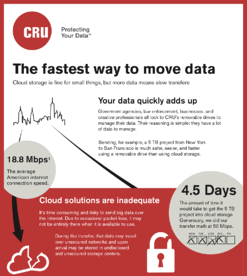 To illustrate the powerful utility of CRU removables, we've updated one of our most popular infographics with the latest info and statistics. Take a look to learn more about why removable drives are an essential and dependable tool in any data management workflow. This entry was posted in Customers, Technical Tips, Storage Systems, Data Backup, Removeable Drive, Data Security by H.G. Blakeman. Bookmark the permalink.